Breakfast in Colombia is a big deal, and I mean that both figuratively and literally! 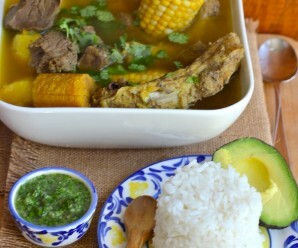 Some of the most popular and traditional Colombian breakfast dishes are quite filling and extremely comforting. When I was growing up, my mom would cook a large, hot breakfast, almost every day of the week, for the entire family. The breakfast usually consisted of some combination of arepa, eggs, cheese and meat, along with hot chocolate, and some days, she would even add rice and beans to the mix! Years later it has not changed. Whenever I go to Colombia to visit my family, my mom makes a warm, filling and comforting breakfast every morning. I have long heard that breakfast is the most important meal of the day, and breakfast has always been an important meal for me. I try never to skip it and even though breakfast during the week has to be simple due to my busy schedule, I make sure it is balanced and healthy for my family and I. The weekends provide for a little more time where we enjoy a larger, more comforting breakfast, as I used to have in Colombia. My breakfasts have changed through the years, as my life has changed. I live in a different country, with a different culture, have kids, a husband, and a business. But, there is one thing that I am convinced will never change…my need for a satisfying desayuno! 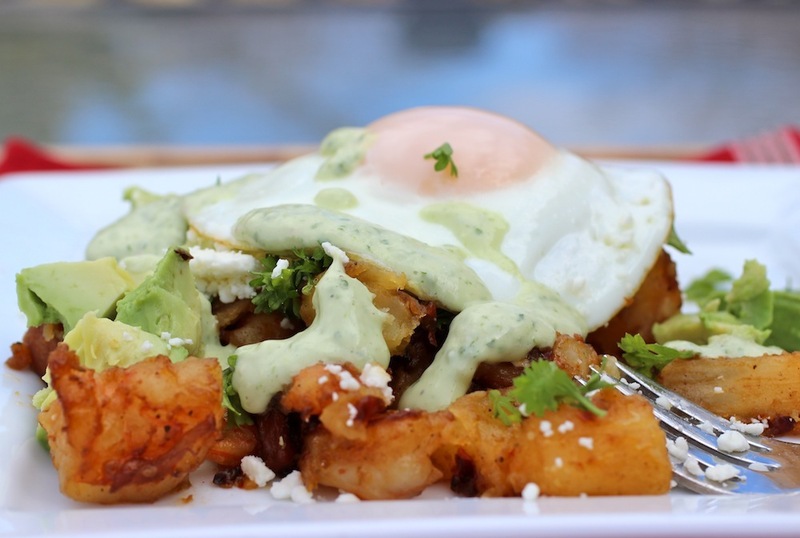 This Shrimp, Chorizo and Yuca Hash was easily prepared and very tasty. 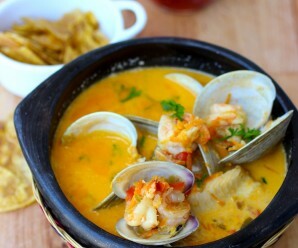 Shrimp, chorizo, yuca and potatoes provide a fantastic mix of flavors, textures and color. I also added an avocado and herbs sauce and topped it with fried eggs to round off the dish. You can prepare your eggs over-easy, scrambled, soft-cooked, poached, or fried as I did. Just don’t skip the eggs, they are the perfect partner to a good hash. 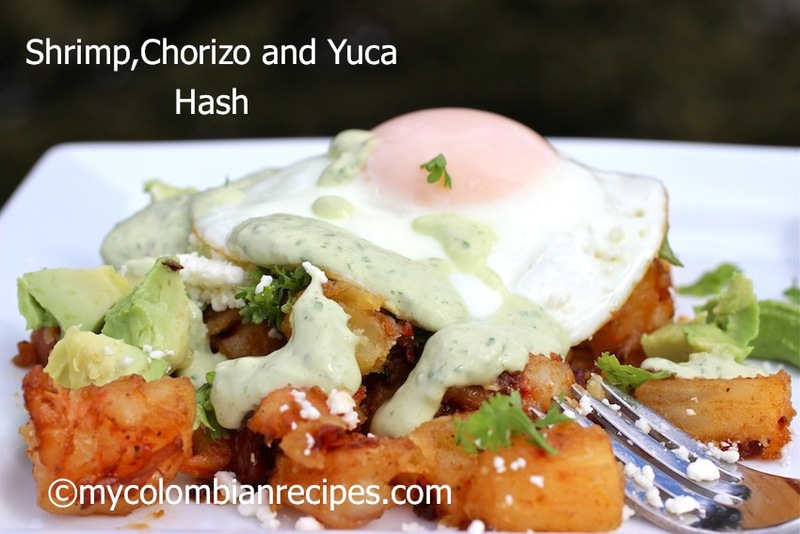 Hash does not get better than this, and I’m not just saying that because I am partial towards Latin ingredients. 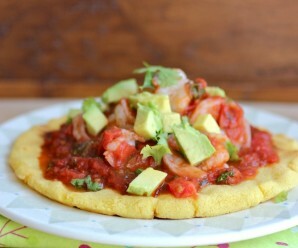 I find the pairing of Colombian chorizo and shrimp, along with the yuca texture, exceptionally unique in a hash. Add to that the creamy, spicy and tangy avocado sauce and you’re getting a burst of flavors that work really well together. Enjoy! In a large sauce pan over medium-high heat, warm the olive oil. Add the onion and cook until tender, about 5 minutes. Add the red bell pepper and cook for 1 minute more. 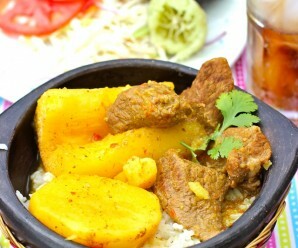 Add the potatoes and yuca, reduce the heat to medium, cover and cook, stirring and scraping the bottom of the pan often, until the potatoes and yuca are almost tender but still hold their shape, about 20 minutes. Add 3 tablespoons of water, the garlic, paprika, ground cumin, chorizo and shrimp to the saucepan. Cook for about 6 minutes more. Taste and adjust the seasonings with salt and pepper. Mix all the avocado sauce ingredients in a blender and reserve. 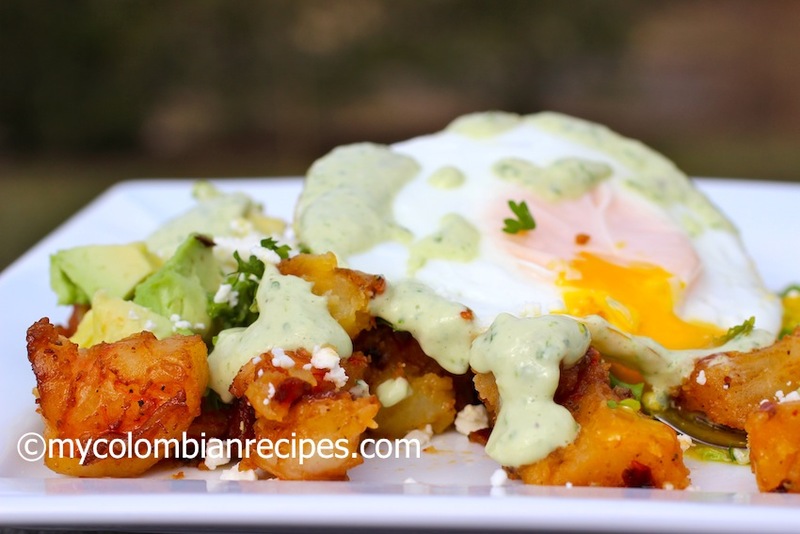 To serve divide the hash among individual plates, drizzle with the avocado sauce and top with and egg. Garnish with fresh cilantro and queso fresco and serve immediately. I really need to join you for breakfast! Count me in too! I love this! For personal/health reasons, I would omit the garlic and be selective about which parts I would personally eat (I avoid fats [chorizo] and foods that repeat on me [peppers, garlic – I hate to be still burping these up five or more hours after the meal]) and would pass on the avocado sauce but my better half and her mother would eat the lot, plus the bits I would filter out. Hi Erika, Yum! I’ll try it soon! Your BIG, BOLD, dashing breakfast took my breath away, sweetheart ! Oh Erica what an awesome breakfast. I am a believer in eating breakfast to and this one would keep the body fuel going fro a long time. I almost bought yuca the other day but the ends looked odd colored, almost moldy. Is it supposed to be dark on the ends?